Home > Top Coats, Base Coats, Nail Treatments & Cuticle Oils > Top Coats For Protected Long Lasting Manicures > Orly Won't Chip Top Coat .60 oz. Orly Won't Chip Top Coat .60 oz. 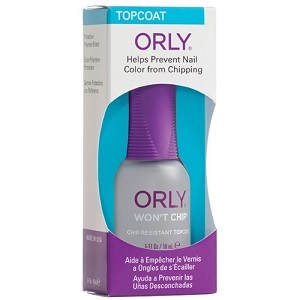 Orly Won't Chip Top Coat, .60 oz. Strong top coat creates a polymer shield that protects nails against chipping and color fading, dries to a high gloss shine.